Here's the second interesting rig I've found in the parking lot at work. 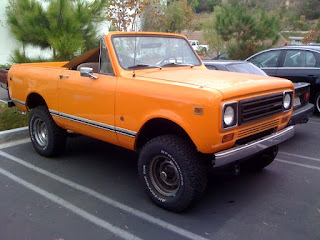 In fact it's the second gloss orange vehicle I've found at work, and just in time for Halloween. What is it? 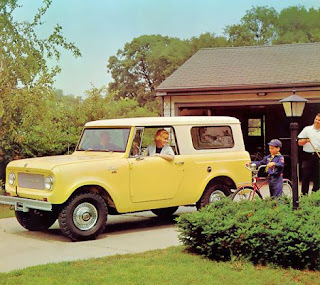 A fourth-generation International Harvester Scout. 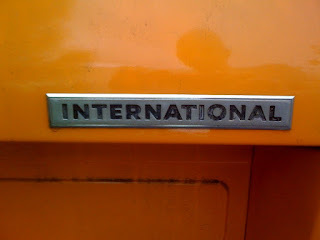 I've always had a soft spot in my heart for Scouts - likely because my grandpa was an exec for IH back in the 60s through the 70s. And because of that he painted his Green Lake homes a similar shade of red to IH's corporate color. I'm surprised that he didn't have one of these, but he was always an Oldsmobile man. This one lives at the high-end custom bi-fold door company that Electra shares a building with. And all it seems to move is from inside the shop to the parking lot every day. My guess is that it's a restoration-in-progress that isn't quite ready (or safe) for the open road. I've never seen it leave the lot. The paint, although dirty, is relatively fresh. 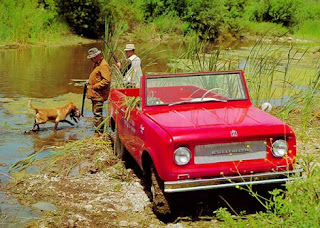 One of the best things about this Scout is it's pure truckiness. No cupholders, leather upholstery, power windows, climate control or front wheel drive. 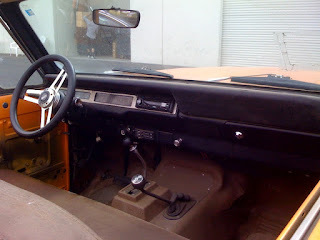 Heck, no door panels at the moment. Amenities? A heater, aftermarket stereo and a cigarette lighter. What more does a truck need? If only all SUVs (Stupid Useless Vehicles) were this pure. Perfect for exploring the mountain roads on Palomar Mountain or the Anza Borrego Desert State Park. 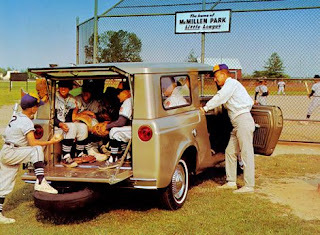 use the slide-out spare tire to cram all the kids in the back, seat belts be damned!